A duodenal ulcer is a peptic ulcer that occurs in the top part of the small intestine, or duodenum. There are several causes, diagnostic tests and treatments for this condition. Food makes its way to your stomach by way of your esophagus, or gullet. Your stomach makes an acid that helps food to be digested and then passes the food along to your duodenum, which is the first part of your small intestine. While in the small intestine, enzymes are mixed with the food in order to digest it. The enzymes are made from cells lining the small intestine and from the pancreas. Once the enzymes break down the food, your body absorbs it. A duodenal ulcer is a peptic ulcer that occurs in the duodenum, which is the most common place for a peptic ulcer to appear. Peptic ulcers are areas where the lining of the intestine is damaged by stomach acid and the tissue underneath is exposed. In 95% of cases, ulcers in duodenum are caused by an infection caused by the Helicobacter pylori, or H. pylori, bacteria. In 5% of cases, duodenal ulcers are cased by anti-inflammatory drug use, such as those used for muscle pains or arthritis, or aspirin, which may be used to protect against the formation of blood clots. Sometimes these medications impact the duodenum's mucous barrier and cause stomach acid to come in contact with the duodenum, resulting in an ulcer. Stomach pain that occurs just under the breastbone is the most common symptom of duodenum ulcer. The pain may come and go and is often most noticeable when you are hungry or before you eat. Sometimes it may wake you up from sleeping. Retching, bloating and feeling ill are other symptoms that may occur. Stomach pain may become worse after eating, or you may feel uncomfortable full. Serious complications of a duodenal ulcer can occur, including a bleeding ulcer or perforation. 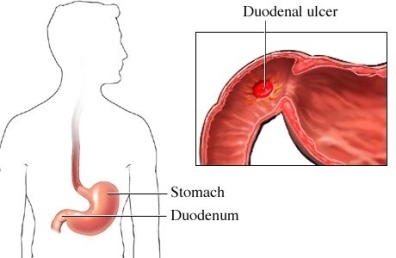 During perforation, the ulcer extends through the wall of the duodenum and can cause acid and food to leak into the abdomen, causing severe pain. If this occurs, seek immediate medical assistance. Acid blockers and antacids may help temporarily relieve stomach pain due to ulcers, but if you experience ongoing symptoms of duodenal ulcer, see your doctor. Diagnosis of duodenal and gastric ulcer differs only by its location in your body. Duodenal ulcers are those that occur in the duodenum, the first part of the small intestine. If the ulcer occurs in the stomach, it is known as a gastric ulcer. A gastroscopy or endoscopy can be performed to determine whether you have an ulcer in the duodenum. During this test, a small telescope is led down your esophagus into your stomach and duodenum. The medical professional is then able to check for and confirm any ulcers or inflammation in these areas. If you are diagnosed with a duodenum ulcer, you will probably have a test to determine if the cause is from an infection from H. pylori bacteria. This can be done by testing stool or blood, a biopsy taken during the endoscopy, or from a breath test. Duodenal ulcer treatment depends on the cause of the ulcer and can include the following. Antibiotics. If you are found to have the H. pylori bacteria, you may be prescribed antibiotics for a couple of weeks to get rid of it, along with medication to reduce the amount of stomach acid produced. Proton pump inhibitors. These medications limit the action of stomach acid production and help to promote healing of the ulcer. They are available in both prescription and over the counter strengths. Because usage of these medications over a long period of time can increase your risk of fractures of the wrist, hip and spine, your doctor may suggest taking a calcium supplement. Acid blockers. Also known as histamine or H-2 blockers, these medications limit the amount of acid from the stomach that is released into the small intestine, which helps with healing and relieves pain. These medications are available by prescription or over the counter. Antacids. These medications help reduce pain by neutralizing stomach acid. They do not promote healing, and can result in side effects such as diarrhea or constipation. Cytoprotective agents. These prescription and non-prescription medications assist with protecting the lining of your small intestine and stomach. Follow up. If duodenal ulcer treatment is not successful or if symptoms are severe, your doctor may suggest having an endoscopy to discover other reasons for your ulcer. Additional endoscopies may also be performed in order to monitor progress. Surgery. Before it was discovered that H. pylori was the primary cause of duodenal ulcers and prior to the availability of medications that control stomach acid, surgery for ulcers was common. It is now only necessary if complications are encountered, such as perforation or bleeding. Don't smoke: Smoking increases the amount of stomach acid produced and can cause the likelihood of an ulcer developing to increase by interfering with the stomach and intestinal lining. Limit alcohol use: Too much alcohol use can cause stomach and intestinal lining irritation, which can cause erosion, bleeding and inflammation. Beverages including orange and grapefruit juice, green and black tea, coffee, white and chocolate milk, hot cocoa, and alcohol. Seasonings and spices, such as garlic, onions or chili powder and red or black pepper. 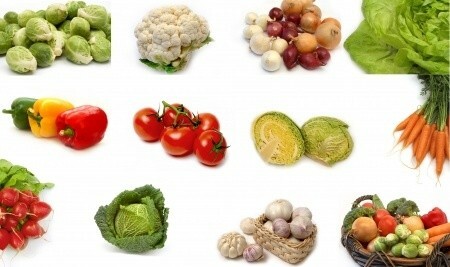 Other foods, including those high in fat, spicy foods, foods containing chocolate, foods made with cream or whole milk, spice cheeses, hot peppers or chilies, seasoned meats like cold cuts, ham, salami or sausages, products containing tomatoes, such as tomato juice, tomato sauce or tomato paste. Foods containing low fat or fat free dairy. Whole grains cereal, brown rice, pasta and whole wheat bread. Meats that are lean cut, poultry, eggs, nuts, eggs, and beans. It is also a good idea to avoid eating during the last 2 hours before going to bed and to eat smaller meals more frequently.